It’s that time of year — we shake off the old and get ready for a new year. 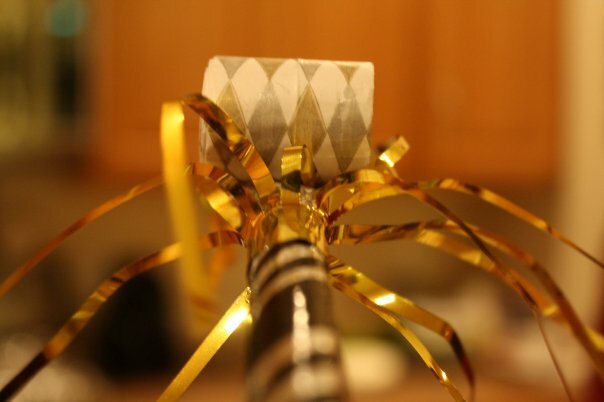 We discuss our new year’s resolutions — how we aspire to change or make ourselves better. All of the athletic equipment goes on sale and health clubs have “no joining fees”. Gym rats complain because come Monday, their “spot” will be taken by a newbie. We resolve to get organized. Last year, a friend of mine said that New Year’s Resolutions are a great way to say that you aren’t good enough. I decided to ditch the word “resolution” and call it a “commitment”. I decided I would run a race every month in 2011. I did great until I hurt my foot in July — again — and just got frustrated. And down on myself. And feeling that I wasn’t good enough. So, I’m here to call BS on resolutions and commitments and anything else that says “I’m not good enough”. Instead of making commitments to lose weight, work out and get organized, etc….I think we should all look at the ways that we shine — and just resolve to do that more. Don’t get me wrong…I think it’s fine to want to lose weight, get organized, better yourself. But, don’t try to change who you are in pursuit of those things. I have come to believe that until we are totally comfortable with who we are — our authentic self — then it’s nearly impossible to change the things that we want to change. I have been asking myself some questions lately. What do people like about me? What do I get compliments on? What do love doing? People often comment on my smile. I’m going to smile more. People comment on my laugh. I’m going to laugh more. People feel welcome in my home. And, I love having people in my home. I’m going to have more parties. I love to sing. I’m going to sing more. Not necessarily to perform. Just around the house, in my car, wherever I am. I love to take pictures. My wonderful husband bought me my second Canon Rebel (because I *gasp* lost mine). I’m going to take more pictures. I might even take a class (well, I will take a class because I promised I would). I love to write. Maybe I’ll write more. Maybe I’ll write about more things. I don’t know and I’ve learned my lesson about making promises to update my blog on a regular basis. I love to read. I had forgotten that I love to read, but I do. I might read more. I love traveling and seeing new things. I plan to continue to explore our new surroundings and spending quality time with my family. I love to be spontaneous. To just wake up in the morning and say, “hey, let’s go do this…”. I love to be able to just invite people over at the last minute. I want to do that more. That’s a start. I’m under no pressure to be something I’m not. I’m just setting the bar higher on the things I love to do anyway. Call it being more intentional. If it has to be a resolution, it’s this simple: I’m going to be the best me I can be. This morning, there is a family grieving the loss of their infant baby girl. Anna Joy was born with a major heart defect. Just like our son (although not the same defect). She immediately had to endure a surgery that could potentially save her life — until the next surgery. Just like our son. As I have read their blog over the past couple of weeks, I have been overwhelmed by the memories. I know what it’s like to see your baby hooked up to every contraption imagineable. I know what it’s like to watch helplessly as they are wheeled away to surgery. I know what it’s like to be in the hospital during the holidays. I know what it’s like to watch the doctors scratch their heads and declare that there is little more they can do for your baby. I know what it’s like to cry out to God, “Please don’t make me bury an infant”. What I don’t know is what it’s like to come home from the hospital without my baby. It’s times like this that I am overwhelmed with “survivor’s guilt”. I’ve experienced it other times as well as dear friends of mine have lost their children…and each time I wonder why. Why was their child taken and not mine? I remember finding very little comfort in well-meaning Christians telling me that God’s ways are perfect. In fact, it makes me mad. “NO!”, I want to scream. This is not perfect. Death is not perfect. The God I believe in is grieving along with me. This was not how it was meant to be. Creation, as God intended, has been broken. I’m not saying that God’s ways are not perfect. As Christians, we believe that He works out all things for good (Romans 8:28). But, sometimes we cannot see the good, especially when we are in the midst of heartbreak. I once heard an analogy about a quilt. We see our lives as the front of the quilt, with just the patterns showing. But if we look under the backing, we would see all of the threads and knots that were needed to make the finished product. Still, not much consolation to a grieving parent. And, then I remember Christmas. The day that we celebrate the birth of God’s son, who was to be the Savior of the world. Jesus was sent to right the wrongs and restore all things to perfection – to the way God intended them to be. To abolish death (2 Timothy 1:10) To give us eternal life so that we would never again have to grieve death (John 3:16). Does any of this make it easier to grieve the death of a child? Absolutely not. But, it gives us hope. A reminder that there is light in darkness (John 1:15). Please lift this family up in thought and prayer. Because as a friend put it, in comparison to this, we don’t actually have any problems. Light a candle tonight and say to the darkness, “we beg to differ” (Mary Jo Leddy). And then listen to this song, written by a friend of ours, about the love, peace and joy that Jesus brings. Driving in the car this weekend, we were listening to the local 24 hour Christmas station. “Blue Christmas” came on and my son asked us to turn the channel. Upon being questioned as to why in the world he didn’t like Elvis, he replied: “Because he sounds like a mixture of Paul McCartney and Scooby Doo”. Maybe it was funnier in person, but that is Life According to Jake.